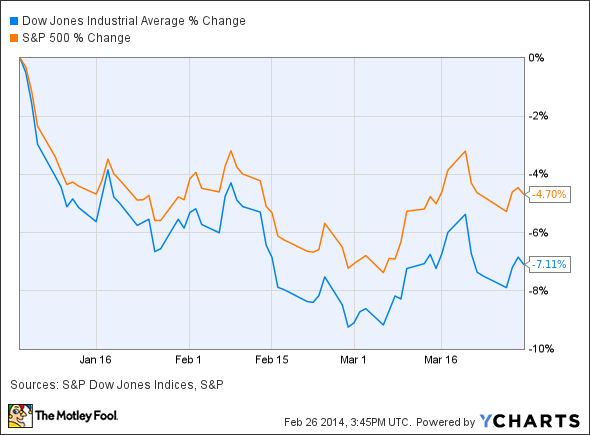 Can Bad Winter Weather Really Hurt America's Economy? The past few months have been brutal for the East Coast, but historically notable storms haven't slowed economic growth, so there's little reason to worry about a weather-driven downturn. 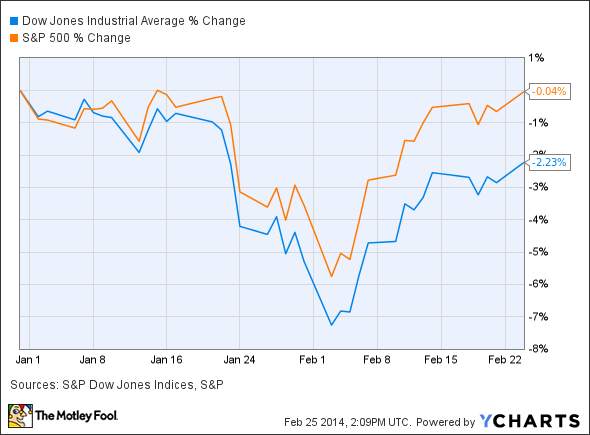 Both the Dow Jones Industrial Average (DJINDICES:^DJI) and the S&P 500 (SNPINDEX:^GSPC) bottomed out on the same day this year: Feb. 3. The next day, things began to improve as the Northeast dug itself out of a major snowstorm. This season's wicked weather has taken a serious toll on the country, as residents of Atlanta suffered the same blizzard conditions as New Yorkers. Already, more than 175,000 insurance claims accounting for $1.5 billion in damage have been paid out for wintry damage, making this year one of the worst since 1993's "Storm of the Century." But does that mean that the economy will continue to limp forward? Let's take a look at some other particularly miserable winters of the 20th and 21st centuries to find out how damaging a bad winter can really be to the American economy. We don't have to reach too far back in time to find another tough winter, as plenty of people in the mid-Atlantic will remember digging their cars out of deep snowdrifts four years ago. "Snowmageddon," as it was called, was only one of several major snowstorms of the 2009-2010 winter season. 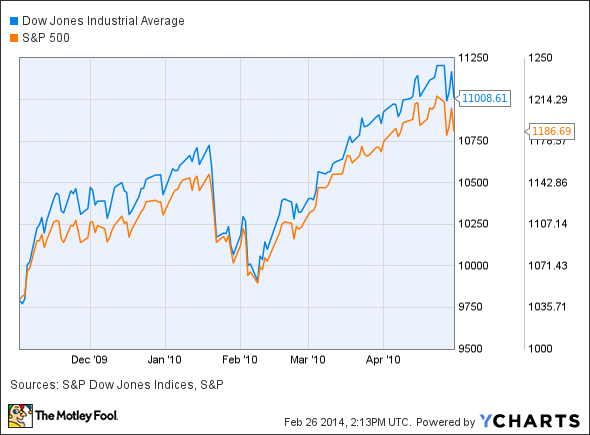 The indexes finished 2010 with gains of roughly 10% each. This was Snowmageddon before we knew what Snowmageddon was. According to the National Weather Service, it "was more significant than most landfalling hurricanes or tornado outbreaks and ranks among the deadliest and most costly weather events of the 20th century." Nearly 40% of the entire U.S. population felt the effects of the Storm of the Century, which dumped snow from Florida to Canada and knocked out power for more than 10 million people. 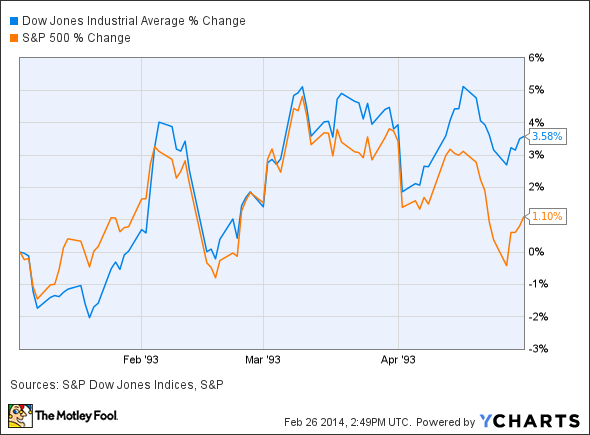 The Dow diverged from the S&P 500 in 1993, finishing with a 14% gain for the year to the more diverse index's 7.6% gain. Old-timers remember 1978 the way today's 20- and 30-somethings might remember 1993. It was a historic year for bad weather, as two monster blizzards hit northern states within a two-week stretch. The first, the "Cleveland Superbomb," pounded the Great Lakes region in late January. Howling winds of up to 100 mph (the 1993 storm later matched or exceeded this speed in some places) whipped accumulations of anywhere from 1 to 3 feet of snow into massive snowdrifts that buried homes and cars and shut down the entire Ohio Turnpike for the first time in history. The next major blizzard, the less-impressively named "Blizzard of '78," swept through New England, New York, and New Jersey less than two weeks after the explosion of the Cleveland Superbomb. Major cities from Massachusetts to New Jersey received record levels of snow, the New York City school system closed (it would only close once more between the time of this storm and 1996), and damages reached nearly $2 billion in inflation-adjusted terms. Nationwide retail sales for January 1978 dipped 3% from December's results, as might be expected, but were 8% higher than sales from January 1977. February's sales came in 1% ahead of January's, and the retail environment continued to post strong growth on a dollar basis throughout the year. Unemployment figures remained largely unchanged from December 1977 to March 1978 -- the unemployment rate ticked down by only 0.1% and there were only 49,000 fewer unemployed people in March than there were the previous December -- but they didn't change much in the months that followed, either. This wasn't a great time for the markets, as the S&P 500 finished with a 2.4% gain and the Dow lost 1.6% over the course of the year. As you can see, the impact of particularly bad winters has not been enough to keep America's economy down these past few decades. As more data rolls in, it should become increasingly apparent that one of two things happened over the past few months: either we've weathered the weather and are getting back to normal, or there's something more broadly wrong with the economy. Thus far, the former seems more likely, but it may take another month or two to fully understand what's happened and where we're going from here.